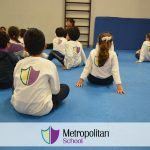 This week students will work in Gymnastics. Gymnastics focuses on balance, flexibility, and core strength. Students will also demonstrate balance on the ground and on different objects using bases of support other than their feet.